Poppy and Pansy. Lily and Daisy. Tulip and Lotus. 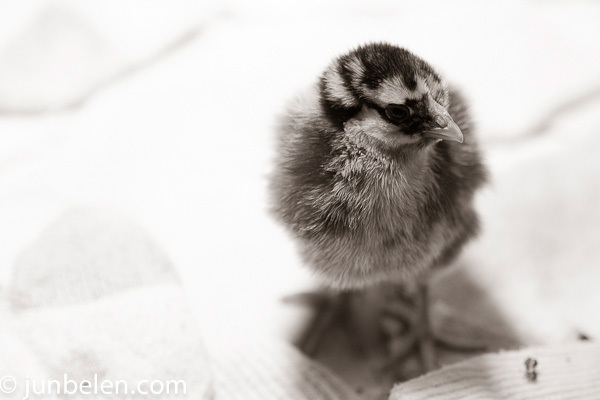 I am so excited for you to meet the new addition to our heritage flock. 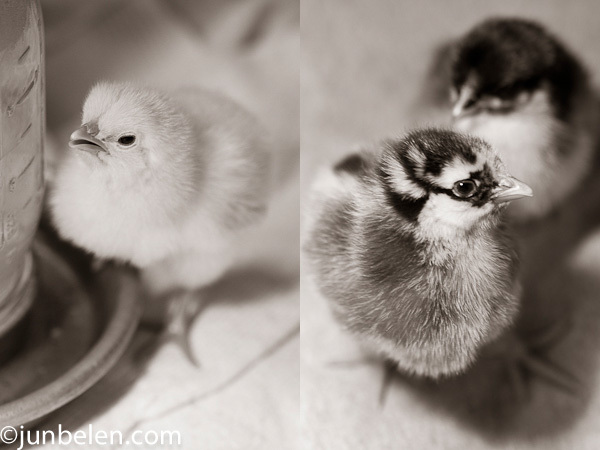 They are settling in nicely in their brooder box, in their new home, pecking and peeping charmingly in between naps. 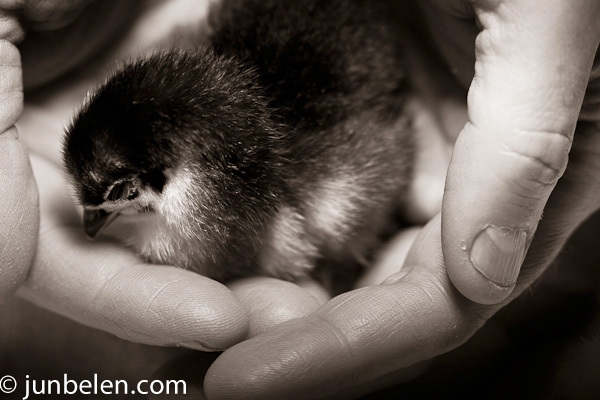 A baby chick literally falling asleep on her feet is the most adorable thing to watch. We got them the same way we got our Golden Girls two years ago. The little fuzzballs came huddled together, all twenty five of them, in a cardboard box, the size of a shoe box. They travelled to California all the way from Iowa, from Murray McMurray Hatchery. We picked half a dozen and delivered the rest to our friends in Soul Food Farm, in Vacaville. We would keep them all if we had the room. Someday, I tell you. For our flock this year we chose Silver Laced Wyandottes, like our dear Blanche, along with Delawares, and Australorps. Poppy and Pansy are the black Wyandottes with the silver stripes on their backs and around their heads. Lily and Daisy are the yellow Delawares. 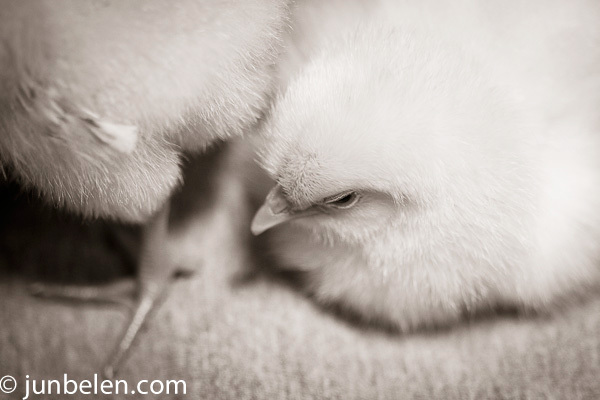 They will grow up to be white hens with black feathers around their neck and the tip of their wings and tails. 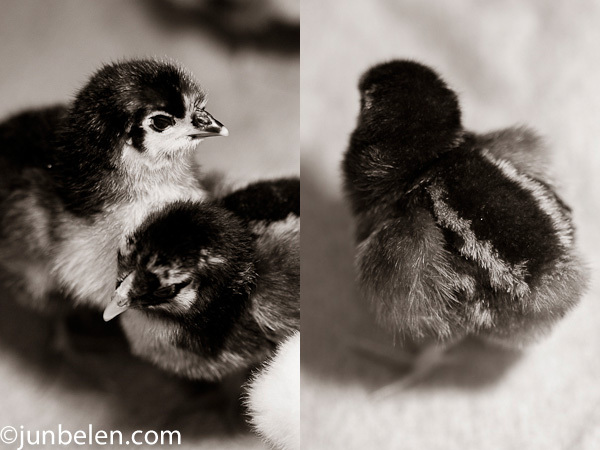 Tulip and Lotus are the black Australorps with black beaks and yellow feathers on their chests. They are all heritage poultry breeds with very good temperament. All prolific brown egg layers. Awww! The Flower Girls are soo cute! I love how puffy and fluffy they are right now- such an endearing look! Congratulations to you and Dennis on the new additions! How exciting to have so many of them. We hope to stop by and see them soon! How much do I love their names?! And oh my gosh, those photos couldn’t be any sweeter. I hope to “someday” to have a couple of my own, as well.